Affordable and effective the BatteryProtect range has been further expanded to include two new models; BatteryProtect 48V-100A and BatteryProtect 12/24V 65A. I wish I’d known about these earlier for my boat as they do far more than just protect. Of course they can be used in any battery application (not just boats) that needs to be protected and isolated. In fact why buy a battery isolation switch at all – when a BatteryProtect can do that and more. Lesson learned as they say. LED display making setup/programming easy. Lithium system remotely controllable disconnect switch. Note that this no longer uses its internal voltage measurement for disconnecting, as it is now remotely controlled by the BMS. Solid state switching for longevity. Can act as a battery isolator and be switched remotely. Use in conjunction with a BMV-700 series battery monitor for audible alarms and monitoring. And why not use the VictronConnect app & Bluetooth Smart dongle with your BMV or MPPT solar charge controller – making life even easier. What exactly can BatteryProtect do? BatteryProtect will disconnect the battery from non-essential loads before it is completely discharged (which would damage the battery) or before it has insufficient power left, to crank an engine for example. Programming made easy using visual LED – can be set to engage / disengage at several different voltages. The seven segment display will indicate which setting has been chosen. Special setting for Li-ion batteries – in this mode the Battery Protect can be controlled by the VE.Bus BMS. Ultra-low current consumption – this is important in case of Li-ion batteries, especially after low voltage shutdown. 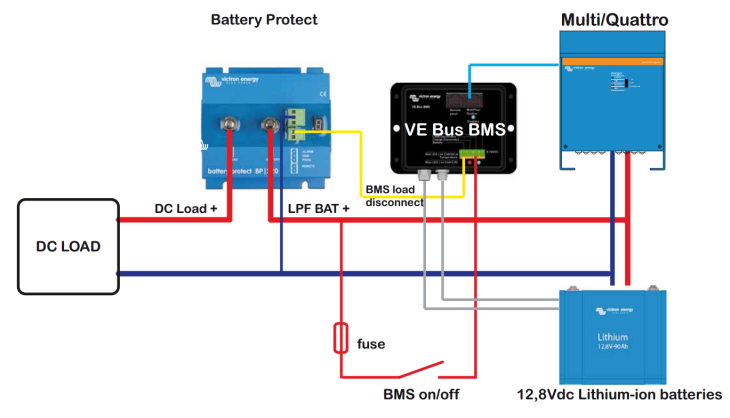 Please see our Li-ion battery datasheet and the VE.Bus BMS manual for more information. Over voltage protection – to prevent damage to sensitive loads due to over voltage, the load is disconnected whenever the DC voltage exceeds 64V; 16 V and 32V respectively for 12V and 24V systems. Ignition proof – no relays but MOSFET switches, and therefore no sparks. Delayed alarm output – the alarm output is activated if the battery voltage drops below the preset disconnect level for more than 12 seconds. Starting the engine will therefore not activate the alarm. The alarm output is a short circuit proof open collector output to the negative (minus) rail, max. current 50mA. The alarm output is typically used to activate a buzzer, LED or relay. Delayed load disconnect and delayed reconnect – the load will be disconnected 90 seconds after the alarm has been activated. If the battery voltage increases again to the connect threshold within this time period (after the engine has been started for example), the load will not be disconnected. The load will be reconnected 30 seconds after the battery voltage has increased to more than the preset reconnect voltage. In addition to the features above (if choosing a 12/24V model) these have automatic detection of 12 or 24 V system voltages.